Waltham: Merc at Moody & Main, Waltham Center; 269 apartments, more than 27,000 feet of retail space and a 300-car parking garage; Three buildings, opening in phases over 2015 and 2016. Town centers across the region are becoming hot spots for new condominium and apartment projects as interest in downtown living spreads beyond the major urban centers. Waltham is leading the way, with the Merc at Moody & Main development — sporting a retro, late-19th- century look — starting to take shape on the site of the historic Mercantile building, torn down in the 1970s in a late spasm of urban renewal. The project will mean hundreds of new residents for the city’s downtown, while also including space for restaurants and shops, according to the developer, Northland Investment Corp.
Other communities are not far behind. Natick just saw an industrial building converted into new market-rate and affordable apartments, the third major residential project downtown in the last few years. In Wellesley Center, the frame of the posh new Belclare condo complex stands on the site of the old Wellesley Inn, with buyers already lining up for units ranging in price from $1.4 million to $3.2 million, according to the developer. And Framingham and Marlborough are exploring ways to lure new housing and new residents to their central districts as part of larger revitalization plans. Wellesley: Belclar, Wellesley Square; 25 luxury condos, five affordable units; 9,500 square feet of retail space; Opening Spring 2015. Homes in suburban subdivisions are still in high demand. But town centers are increasingly being seen as an attractive alternative by some, especially young professionals and empty nesters, developers say. With local roads and highways becoming ever more clogged by traffic, one attraction is easy access to public transportation, said Marty Jones, chief executive of the Massachusetts Development Finance Agency, which is working with communities to encourage new downtown housing. The new multiple-unit projects being built in Natick, Waltham, and Wellesley are all within a short walk of commuter rail stations and bus lines. Merc at Moody & Main, on track to open in phases next year and into 2016, is within a block of the Waltham commuter rail station, Standish said. The new project comes more than a decade and a half after the opening of Cronin’s Landing, a 281-unit apartment complex where the old Grover Cronin department store once stood. 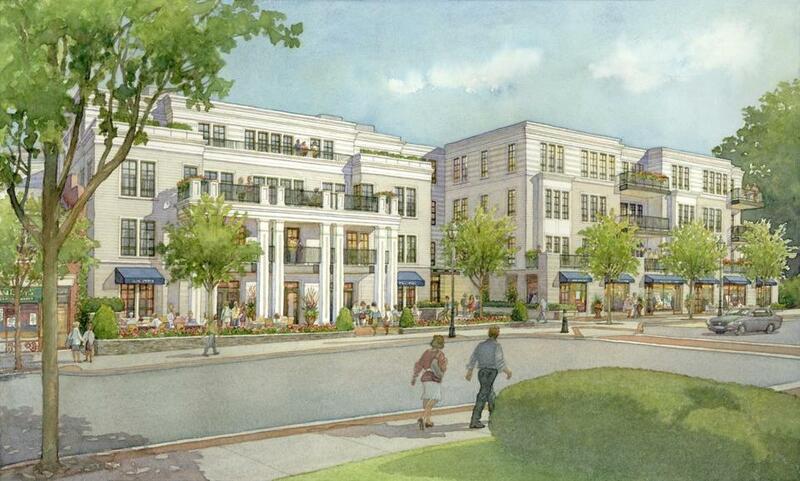 Northland spent a decade working on its own plans for the downtown area. “For us, this is dead center in Waltham Center,” Standish said. “There is bus service right at your door into the financial district” in Boston. 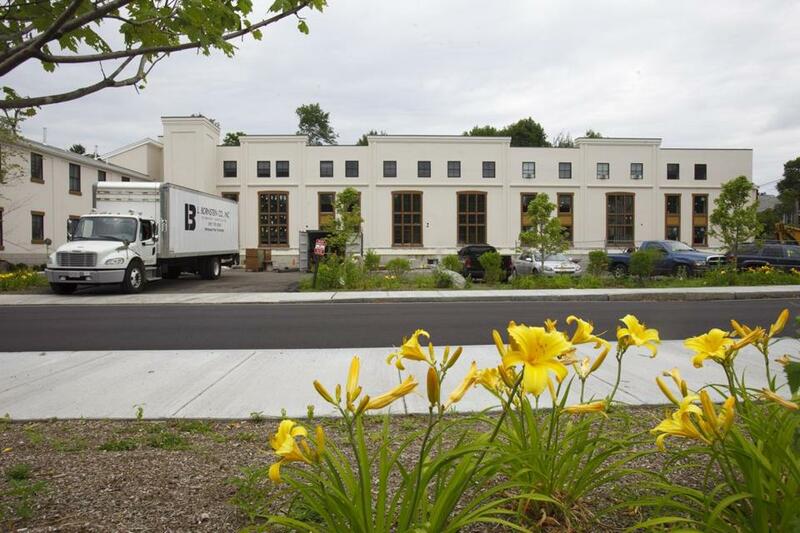 In Natick, local developer Walnut Place Residences LLC recently converted an old industrial building near the town center on North Avenue into 41 new, mainly market-rate apartments, with a design inspired by the old building’s stylish façade. The new Walnut Place Residences complex sits just a couple of blocks from the commuter rail’s Natick Station stop, said Meredith Coakley, the project’s manager. “You can actually see the platform from the property line,” Coakley said. Also, MathWorks Inc., a major computing software company, runs a shuttle from the station to its headquarters campus on Route 9. The apartment project follows on the heels of two dozen upscale condos that opened a few years ago, literally on the other side of the tracks on South Avenue, with the MBTA rail station practically on its doorstep. Natick: Walnut Place Residences, near Natick Center and commuter rail station; 41 apartments; First building open, second building ready by September. The town’s turn-of-the-century National Guard armory building, a five-minute walk from the T station, was converted into town houses during the same period. Meanwhile, 11 new apartments are being built in the upper floors of a 19th-century retail building on the same block as the train station, said Patrick Reffett, Natick’s community development director. In Wellesley, the new Belclare is also just a short jaunt past a row of shops and across the center’s main thoroughfare from the Wellesley Square rail station. But restaurants and shops are also part of the increasing allure of living downtown. Waltham offers a wide variety of restaurants and pubs along Moody Street, while Wellesley has attracted chef-entrepreneurs like Ming Tsai, owner of Blue Ginger. Natick has its own restaurant scene, as well as boutique shops offering jewelry and crafts, and the Center for Arts in Natick, which has a steady schedule of musical acts and other performances in a renovated 19th-century fire station. And the price is right as well. Both Waltham’s Merc and Wellesley’s Belclare are comparing themselves to — and competing with — downtown Boston projects. The Merc will provide a more affordable option to young professionals and others who don’t want to or simply can’t afford to live in downtown Boston, Standish said. While rents have yet to be determined, they are likely to be in the $2.50 to $3.50 per-square-foot range, compared with $4 to $7 a square foot for similar apartments in downtown Boston, he said. “It provides a necessary alternative to downtown Boston living because the affordability of apartment living in downtown Boston has become very, very expensive,” Standish said. Wellesley’s Belclare is pitching itself to the other end of the age spectrum, empty nesters looking to downsize from their suburban homes after the kids have grown up and moved out . While the project’s prices average just under $2 million, the units are more affordable than what’s for sale in high-rise projects in downtown Boston, which can easily run well into the millions, according to Jordan Warshaw, president of the Noannet Group LLC, one of project’s development partners. And in Natick, the new Walnut Place residences are renting for $1,100 to $2,250 a month, Coakley said. Marlborough and Framingham are now looking to jump on the downtown housing bandwagon as well. Framingham is hoping to encourage residential projects downtown by changing zoning to allow for mixed-use development. 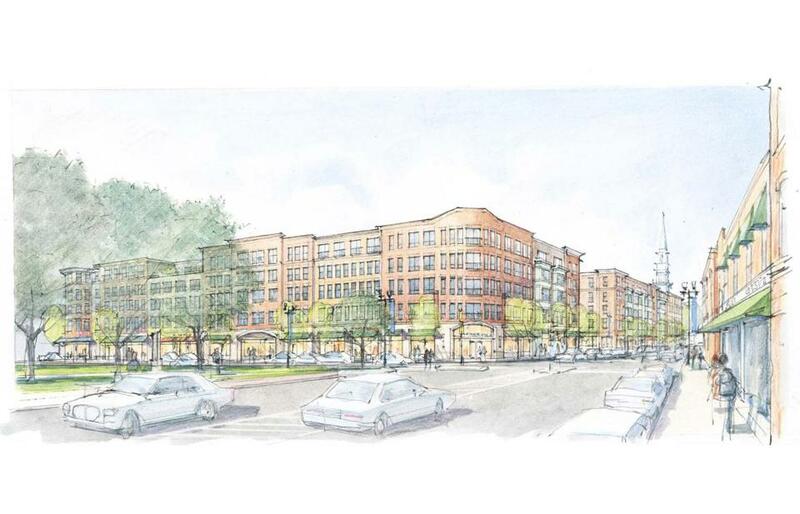 Selectmen looked at conceptual renderings last spring of a multistory housing and retail complex near the intersection of Routes 126 and 135. In Marlborough, the city is working with the Metropolitan Area Planning Council to explore ways to bring more housing and mixed-use development downtown as well, said Tim Cummings, executive director of the Marlborough Economic Development Corporation. One idea being explored would allow new apartments or condos to be carved out on the upper floors of downtown retail buildings, he said. Scott Van Voorhis can be reached at sbvanvoorhis@ hotmail.com.